Mobile internet use has recently surpassed desktop internet use for the first time in history. 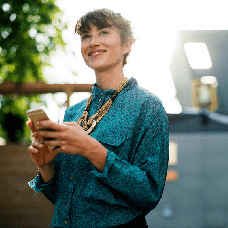 It is only natural that the owners of online dating services require either mobile apps or a responsive design for their website so that it could work on any device. We at the Dating Pro team have invested in both options. Find out more about the responsive design theme for the Dating Pro software, and the evolution story of the mobile app for Android. 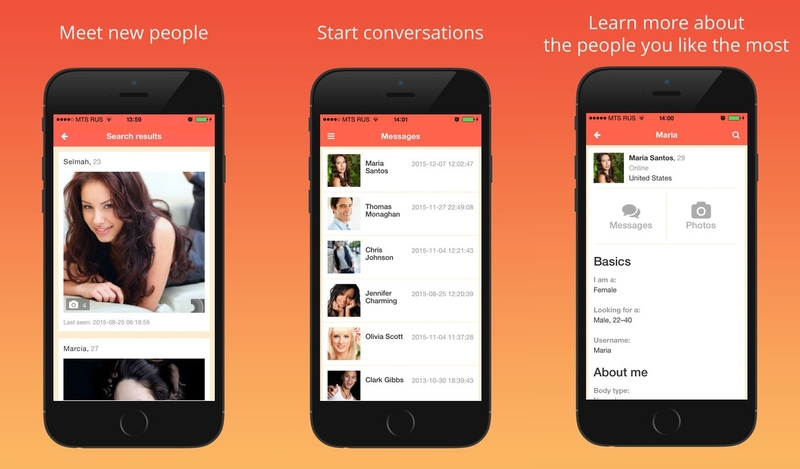 Now we would like to talk about the dating mobile app for the iOS platform. Now, our goal is to improve the app further, and re-create it with the native tools so that it works seamlessly with the operating system and makes use of its built-in functionality. The main idea is to combine feedback from our customers with the analysis of the most popular mobile apps. So it will help your dating service members to be content with the service that you provide on mobile and to keep returning until they find what they have been looking for. Our starting point is the experience that a person expects to dive into after they download and install a dating app. What can it be? Definitely, a way to filter all users, to view the users who match the filter criteria (besides, the system might well offer matches based on the person’s profile automatically), and a way to start the conversation. We’ve made a list of features by writing down all possible expectations. Since we do not want the app to be overblown, every feature has been vetted by the team. We’ve asked ourselves whether this or that feature would actually contribute to reaching the business goals of our customers. As a result, we now have a much shorter list that will be put to work. After the dating app is installed, the user starts receiving notifications about new messages, new gifts, and profile visits. Thanks to the push notifications, it will be possible to create shortcuts to the app pages where the user can send a reply or leave a comment. • A new message is received which prompts the sound or vibrate alerts. • The user taps on the notification. • The tap gets them to the relevant page in the app where they send a reply. • The user closes the app by swiping down or by locking the screen. Initially, we wanted to go without the tab bars, to not clutter the space. 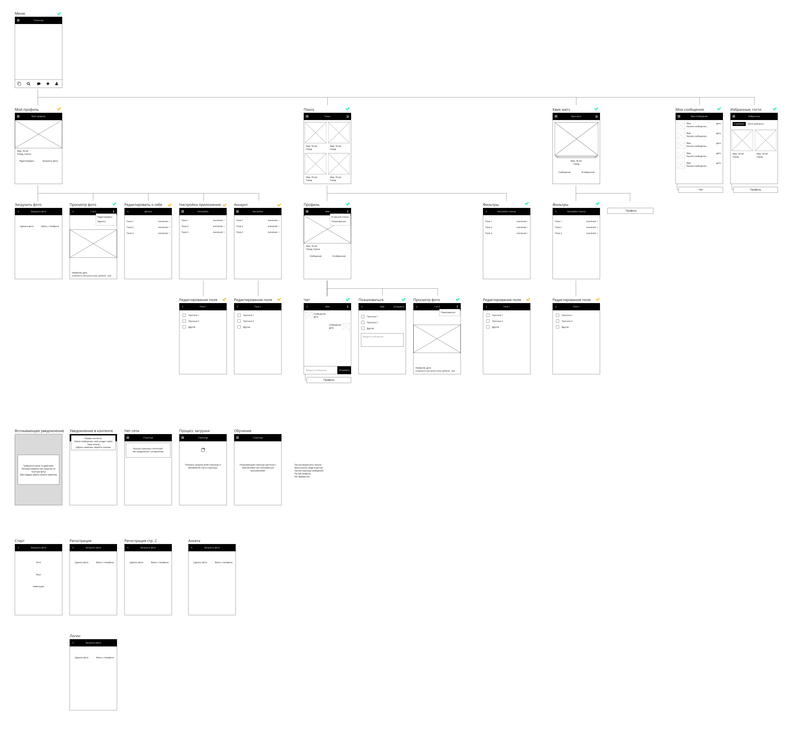 After giving it a thought, we decided to follow the iOS guidelines and added the tab bars into the wireframes. It will make sure that the users will encounter a familiar interface once they launch your dating app. During the first few years after the Dating Pro’s iOS app came to be, we have received hundreds of modification and improvement ideas. At the moment the second generation of the iOS app is under way. We have used all of our experience in getting it ready, and read every piece of feedback. The application will soon be available in the App Store for download, and it will work on iOS 8 and above. It stands to reason that we have a massive backlog of features and a lot of hypotheses to test. We apply the agile approach to the development, so please expect regular updates with the new features and interface improvements. We are open to all suggestions and critical feedback. Leave your comments below or come to chat with us; we’d love to hear from you!